Wien - Wer sich heute den Ausstellungstitel Formatierung einer neuen Ära für die Präsentation seiner Arbeiten aussucht, hat einen Sinn fürs Makabre. Wie der österreichische Bildhauer Karl Karner. Seine so bezeichnete Soloschau ist derzeit in der Wiener Galerie Lisabird Contemporary zu sehen. An dem 1973 im steirischen Feldbach geborenen Karl Karner, ist noch etwas außergewöhnlich: Zusammen mit der Choreografin Linda Samaraweerová zeigt er seit dem Jahr 2005 komplexe Performancearbeiten, die auch im Feld des zeitgenössischen Tanzes erfolgreich sind. erstarrter Lavagebilde, die dramatische Ein- und Durchblicke erlauben. Aus der Nähe werden allerdings Formen sichtbar, die mit der Natur nichts mehr zu tun haben: Ketten aus Kugeln, Kerzenhüllen, Nägel und Stangen. (mit Royl Culbertson) zu erfahren war. Dafür mischten Karner/Samaraweerová Zitate aus ihrem Auftritt in "White For" (2013, Tanzquartier) mit neuen Szenen. Da sitzt der Künstler etwa auf einem Bankerl, schaut durch eine Art Filmrolle und verzerrt sein Gesicht zu einer Entsetzensfratze. Sagt Samarawerová: "Aber ich will keinen Schritt wagen, der mich nicht zerreißt." The Lisabird Contemporary-Gallery is displaying a personal exhibition of the sculptor Karl Karner. His work also includes performance art. Vienna - Who today names his exhibition "Formatting a New Era" has an obvious taste for the macabre. 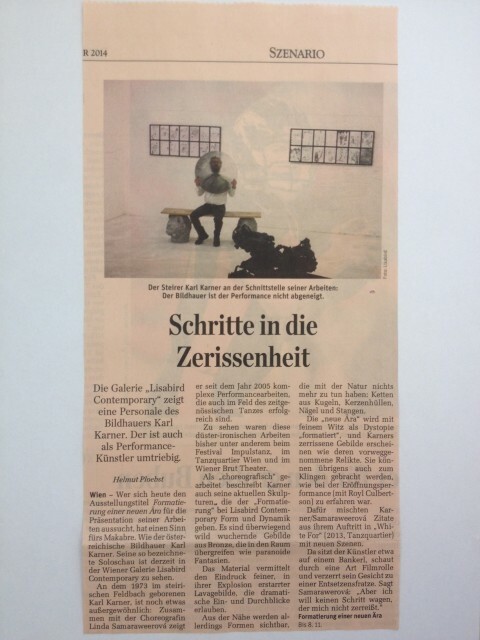 So does the Austrian sculptor Karl Karner whose solo-exhibition with this title is on in the Lisabird Contemporary-Gallery in Vienna. There is another unusual feature to Karl Karner, who was born in the Styrian town Feldbach in 1973: Since the year 2005 he, together with the choreographer Linda Samaraweerová, also shows complicated works of performance art which are also successes in contemporary dance. These gloomy-ironic pieces of work have been performed at the "Festival Impulstanz", at the Tanzquartier Wien and in the Wiener Brut Theatre. "Worked in a choreographic manner" is what Karner says about his latest sculptures that bring form and dynamics to "Formatting" at Lisabird Contemporary. These are mainly forms made of bronze, wildly wuthering, ranking into the room like paranoid fantasies. The material is reminiscent of fine forms of lava frozen in their explosion allowing dramatic insights and views. From a closer point of view forms are appearing which do not have anything to do with nature anymore: chains made of bowls, mantles of candles, nails and poles. The "new era" is "formatted" as dystopia with a fine sense of humour and Karner's torn forms appear just as their anticipated relicts. They can be used to produce sounds as this could be experienced through the course of the opening ceremony (with Roye Culbertson). Karner/Samaraweerove mixed quotations taken from their appearance in "White Forms" (2013, Tanzquartier) with new scenes. The artist is sitting on a bench, looking through some kind of film reel and is turning his face into an appalled face of frowns. Samaraweerová says: "But I don't dare a single step that does not tear me."